ummary: A new study reveals psychedelics increase dendrites, dendritic spines and synapses, while ketamine may promote neuroplasticity. The findings could help develop new treatments for anxiety, depression and other related disorders. A team of scientists at the University of California, Davis is exploring how hallucinogenic drugs impact the structure and function of neurons — research that could lead to new treatments for depression, anxiety, and related disorders. In a paper published on June 12 in the journal Cell Reports, they demonstrate that a wide range of psychedelic drugs, including well-known compounds such as LSD and MDMA, increase the number of neuronal branches (dendrites), the density of small protrusions on these branches (dendritic spines), and the number of connections between neurons (synapses). These structural changes suggest that psychedelics are capable of repairing the circuits that are malfunctioning in mood and anxiety disorders. “People have long assumed that psychedelics are capable of altering neuronal structure, but this is the first study that clearly and unambiguously supports that hypothesis. What is really exciting is that psychedelics seem to mirror the effects produced by ketamine,” said David Olson, assistant professor in the Departments of Chemistry and of Biochemistry and Molecular Medicine, who leads the research team. Ketamine, an anesthetic, has been receiving a lot of attention lately because it produces rapid antidepressant effects in treatment-resistant populations, leading the U.S. Food and Drug Administration to fast-track clinical trials of two antidepressant drugs based on ketamine. The antidepressant properties of ketamine may stem from its tendency to promote neural plasticity — the ability of neurons to rewire their connections. “The rapid effects of ketamine on mood and plasticity are truly astounding. The big question we were trying to answer was whether or not other compounds are capable of doing what ketamine does,” Olson said. Olson’s group has demonstrated that psychedelics mimic the effects of ketamine on neurons grown in a dish, and that these results extend to structural and electrical properties of neurons in animals. Rats treated with a single dose of DMT — a psychedelic compound found in the Amazonian herbal tea known as ayahuasca — showed an increase in the number of dendritic spines, similar to that seen with ketamine treatment. DMT itself is very short-lived in the rat: Most of the drug is eliminated within an hour. But the “rewiring” effects on the brain could be seen 24 hours later, demonstrating that these effects last for some time. Summary: A new study reveals psychedelics increase dendrites, dendritic spines and synapses, while ketamine may promote neuroplasticity. The findings could help develop new treatments for anxiety, depression and other related disorders. Psychedelic drugs such as LSD and ayahuasca change the structure of nerve cells, causing them to sprout more branches and spines, UC Davis researchers have found. This could help in “rewiring” the brain to treat depression and other disorders. In this false-colored image, the rainbow-colored cell was treated with LSD compared to a control cell in blue. NeuroscienceNews.com image is credited to Calvin and Joanne Ly. Behavioral studies also hint at the similarities between psychedelics and ketamine. In another recent paper published in ACS Chemical Neuroscience, Olson’s group showed that DMT treatment enabled rats to overcome a “fear response” to the memory of a mild electric shock. This test is considered to be a model of post-traumatic stress disorder (PTSD), and interestingly, ketamine produces the same effect. Recent clinical trials have shown that like ketamine, DMT-containing ayahuasca might have fast-acting effects in people with recurrent depression, Olson said. These discoveries potentially open doors for the development of novel drugs to treat mood and anxiety disorders, Olson said. His team has proposed the term “psychoplastogen” to describe this new class of “plasticity-promoting” compounds. “Ketamine is no longer our only option. Our work demonstrates that there are a number of distinct chemical scaffolds capable of promoting plasticity like ketamine, providing additional opportunities for medicinal chemists to develop safer and more effective alternatives,” Olson said. A team of scientists at the University of California, Davis, is exploring how hallucinogenic drugs impact the structure and function of neurons — research that could lead to new treatments for depression, anxiety and related disorders. In a paper published on June 12 in the journal Cell Reports, they demonstrate that a wide range of psychedelic drugs, including well-known compounds such as LSD and MDMA, increase the number of neuronal branches (dendrites), the density of small protrusions on these branches (dendritic spines) and the number of connections between neurons (synapses). These structural changes could suggest that psychedelics are capable of repairing the circuits that are malfunctioning in mood and anxiety disorders. Behavioral studies also hint at the similarities between psychedelics and ketamine. In another recent paper published in ACS Chemical Neuroscience, Olson’s group showed that DMT treatment enabled rats to overcome a “fear response” to the memory of a mild electric shock. This test is considered to be a model of post-traumatic stress disorder, or PTSD, and interestingly, ketamine produces the same effect. Recent clinical trials have shown that like ketamine, DMT-containing ayahuasca might have fast-acting effects in people with recurrent depression, Olson said. Additional co-authors on the Cell Reports “Psychedelics Promote Structural and Functional Neural Plasticity.” study are Calvin Ly, Alexandra Greb, Sina Soltanzadeh Zarandi, Lindsay Cameron, Jonathon Wong, Eden Barragan, Paige Wilson, Michael Paddy, Kassandra Ori-McKinney, Kyle Burbach, Megan Dennis, Alexander Sood, Whitney Duim, Kimberley McAllister and John Gray. Olson and Cameron were co-authors on the ACS Chemical Neuroscience paper along with Charlie Benson and Lee Dunlap. The work was partly supported by grants from the National Institutes of Health. the field of molecular psychiatry in recent years. Lucki, 2013; Li et al., 2010). 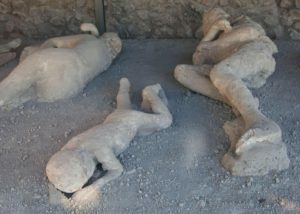 Greek roots psych- (mind), -plast (molded), and -gen (producing). as lead structures for identifying safer alternatives. to produce changes in neuronal structure. attributed to an increase in monoamine neurotransmission. plasticity-promoting small molecules have been identified previously. for medicinal chemistry efforts aimed at identifying neurotherapeutics. structure (Wacker et al., 2017). to assess the kinetics of psychedelic-induced plasticity. that is not restricted to a particular structural class of compounds. increased amplitude and frequency of spontaneous EPSCs. (Moskal et al., 2017; Yang et al., 2015; Zanos et al., 2016). of psychoplastogens, fast-acting antidepressants, and anxiolytics. with improved efficacy and safety profiles. Ketaminealexandria.com 703-844-0184 Call for an infusion to treat your depression. PTSD, Anxiety, CRPS, or other pain disorder today. Ketamine has been used as an anesthetic for 50 years, and for decades the clinicians prescribing it have noticed sudden, appreciable anti-suicide and antidepressant effects in their patients. Case reports of desperate suicidal depressionrelieved within half an hour were discussed in the waning years of the 20th century, but actual research papers with small trials have only started trickling in within the last two decades. Even after all this time, the research done thus far has not led to ketamine being mainstream FDA-approved as standard therapy for depression or suicidal ideation. For one thing, the kind of ketamine used in the US for most of the last 50 years is an IV drip requiring nursing and vital sign monitoring. In my neck of the woods, IV ketamine treatment is $3,000 (not covered by insurance or Medicare), usually completed in six treatments over two weeks. Not exactly within reach for many of my patients with resistant depression (who tend to decline in socioeconomic status over time). In the case studies, folks’ depression rather notoriously rebounded back from ketamine therapy and then became resistant, though that didn’t happen to everyone. But how could we study how effective ketamine is? It’s generic, so there’s no pharmaceutical company with the millions to blow on state-of-the-art, beautiful randomized controlled trials to bring before the FDA. The patient population for ketamine is also a difficult one. Suicidal folks and depressed people with illness resistant to standard therapy or meds are more likely to give a drug company an expensive and public failure rather than profit, no matter that this is a population desperately in need of new ideas and new thinking. However, new formulations and the slow grind of publicly funded studies means new life for this elderly drug. Before we talk about how ketamine works, let’s talk about how mental illness arises in terms of the actual pathology in the brain. (Note: This will necessarily be an oversimplification.) In short, most mental illness develops at the intersection of too much emotional or physical stress and genetic vulnerability leading to limitations in efficient brain functioning. This happens when brain becomes overwhelmed with excitatory signals: too much stress, too much activation of the fight-or-flight nervous system leading to specific over-activation of certain brain areas (like the left prefrontal cortex, the hippocampus, or the amygdala) without compensatory time or resources for recovery and repair. The emotional and physical stressors could be, for example, a death in the family, extended work stress, viral illness that affects the brain, medications that affect the brain, or traumatic brain injury. The genetic vulnerability could be an increased inefficiency in being able to make specific neurotransmitters or brain fertilizers that help in recovery and repair, or an increased genetic ability to send excitatory ions through cell membranes, or many more complex issues we haven’t yet figured out. Under this theory, almost any intervention could decrease symptoms of mental illness if it increases general neuron recovery and repair—or the efficiency of neurotransmitter use in the recovery and repair pathway—or reduces neurotoxic activation of the excitatory pathway (or “excitotoxicity“). Interventions such as regular exercise, meditation, psychotherapy, selective serotonin reuptake inhibitors (SSRIs), antipsychotics, lithium, magnesium, anti-seizure meds and many other treatment paradigms can be at least partially effective to decrease symptoms. Keep in mind, sometimes the disease is a tank, and the spear in your arsenal (regular exercise, for example) is never going to be enough to take out that tank. Sometimes you need anti-tank missiles (such as low dose antipsychotics for severe resistant depression). Ketamine is, among many other things, an NMDA receptor antagonist(though even this characterization is complicated). This means that ketamine blocks the action at the NMDA receptor, normally turned on by the major excitatory neurotransmitter in the nervous system, glutamate. NMDA receptor over-activation is ground zero for excitotoxiticy, kind of like a gas pedal that is stuck in the downward position. So far, though, not a single FDA-approved psychiatric medication in general practice specifically unsticks that gas pedal. But ketamine does. (So will, to a much lesser extent, magnesium* and the supplement NAC, which decreases glutamate concentrations). This gas pedal unsticking is how ketamine can seemingly do the impossible: take a dangerously suicidal patient and make them feel much, much better in less than an hour. In 2016, a new formulation of ketamine, esketamine, was granted FDA “breakthrough therapy” designation for major depressive disorder with imminent risk of suicide. It’s a nasal spray used in Europe for anesthesia, but never used in the US before. It has three to four times the affinity for the NMDA receptor as ketamine and fewer intolerable side effects (such as hallucinations, dissociation, and dangerous fluctuations of vital signs). A phase two study of esketamine was published in April 2018, a randomized controlled trial of suicidal depressed patients. They agreed to be monitored on an inpatient unit for five days after the first administration of the medicine, followed by twice-a-week administration for four weeks in addition to standard antidepressant treatment. To empathize how ill the population in this study was, three (placebo) patients out of 68 made suicide attempts during the follow up period, and half needed additional suicide precautions during their inpatient stay (usually decreased time between nursing checks which is, at the low end, every 15 minutes on a standard inpatient unit). Esketamine results separated from those of placebo treatment by four hours and at 24 hours, with rapid relief from suicidal thoughts and depressive symptoms, but there seemed to be no difference with esketamine and placebo at 25 days. 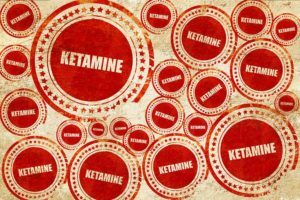 This study seems to support the old case study observations, that ketamine can be amazingly helpful short term, but is not really a long-term intervention. But it’s hard to tell, and we need more data. No one really knows why there’s such a rapid ketamine poop-out, but from a clinical perspective, who cares? A fast intervention that decreases suicidal ideation could save lives while our other, proof-tested, slower interventions take their time to work. This could also shorten inpatient hospital stays for depression, freeing up precious resources and getting people back to their families, work, and communities. While the use in observed settings such as inpatient units and emergency rooms is likely to accelerate, we need way more-real world data before we start prescribing nasal spray in outpatient treatment, especially for dangerously suicidal patients. Ketamine studies have also opened the doors for other NMDA receptor antagonist interventions. Some drugs in development include new formulations of dextromethorphan and rapastinel. Given that psychiatric drugs have been endless renditions of the same tricyclic antidepressants, SSRIs, dopamine blockers, and dopamine partial agonists for decades, we could use a new approach. And remember, there are plenty of ways to unstick that gas pedal early in the game, with proper self care and healthy living. Modern life, in America at least, doesn’t much incentivize vacation or sleep, both of which help that recovery and repair cycle. As a psychiatrist I’ll use whatever evidence-based intervention I can at any stage to treat the patient where he or she is to make them start getting better in the moment. As a health writer I can suggest eating a (mostly) home-cooked whole foods diet, avoiding a lot of alcohol and smoking, and getting enough physical movement, rest, and recharging time. In the brain, it’s all about reducing that excitotoxicity. In life, it’s all about a clear head, good energy, and serenity. Traditional antidepressants may take weeks to work on individuals. There have been associations with increased suicidality in some studies. The need for a more rapidly acting antidepressant is important. The study below investigated the antidepressant effect of Ketamine by looking through an FDA database and observing associations of pain and depression reduction with the use of Ketamine. They were clearly present. Of note, minocycline and Diclofenac also seemed to be associated with improved depression parameters. The history of ketamine as an illicit drug favored for its hallucinogenic effects presents ethical obstacles to its use in large clinical trials. Researchers from the University of California San Diego in La Jolla, therefore employed an Inverse-Frequency Analysis approach to investigate whether ketamine, when administered in addition to other therapeutics, has antidepressant properties. The team applied the inverse frequency analysis method, which looks for negative statistical patterns in the US Food and Drug Administration (FDA) Adverse Event Reporting System (FAERS) post-marketing database of more than 8 million patient records. They observed reductions in depression and pain in patients receiving ketamine, as indicated by negative log odds ratio (logOR) values (logOR, -0.67 ± 0.034 and logOR, -0.41 ± 0.019, respectively). “The data we analyzed are indirect and skewed by cases of bad or lethal adverse effects. Nevertheless the statistics were sufficient to notice the trends,” explained study co-author, Ruben Abagyan, PhD, in an interview with Clinical Pain Advisor. The IFA method was also used to evaluate ketamine efficacy and associated side effects reported in the FAERS database. The investigators found significant reductions in a number of side effects associated with opioid therapies, including constipation (LogOR −0.17 ± 0.023), vomiting (LogOR −0.16 ± 0.025), and nausea (LogOR −0.45 ± 0.034) compared with other drug combinations used for pain management. The authors concluded that their findings are in line with those from smaller studies, indicating beneficial effects for ketamine as a monotherapy or adjunctive therapy for depression, particularly treatment-resistant depression, with particular indication for patients with suicide ideation, because of its rapid onset of action. “The results should serve as a motivation to conduct a proper clinical trial for the rapid onset treatment of severe depression,” Dr Abagyan noted. The novel analysis employed in this study may help investigate off-label indications for other drugs. “Ideally the method we proposed should be applied to the actual clinical data rather than the somewhat biased set of un-normalized FAERS reports,” Dr Abagyan added. “The method [can be used] to observe unexpected effects of a treatment by looking at the reduction of the baseline of this effect upon treatment. It can be applied to any effect that is being recorded including cancer, viral diseases mortality, longevity.” he concluded. Cohen IV, Makunts T, Atayee R, Abagyan R. Population scale data reveals the antidepressant effects of ketamine and other therapeutics approved for non-psychiatric indications. Sci Rep 2017;7:1450. Sansone RA, Sansone LA. Antidepressant adherence: are patients taking their medications?. Innov Clin Neurosci. 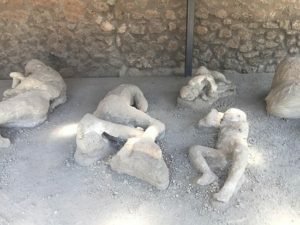 2012;9(5-6):41-46. Frazer A, Benmansour S. Mol Psychiatry. Delayed pharmacological effects of antidepressants. Mol Psychiatry 2002;7:S23-8. Price RB, Iosifescu DV, Murrough JW, et al. Effects of ketamine on explicit and implicit suicidal cognition: a randomized controlled trial in treatment-resistant depression. Depress Anxiety 2014;31:335-343. DiazGranados N, Ibrahim LA, Brutsche NE, et al. Rapid resolution of suicidal ideation after a single infusion of an N-methyl-D-aspartate antagonist in patients with treatment-resistant major depressive disorder. J Clin Psychiatry 2010;71:1605-1611. Alberich S, Martínez-Cengotitabengoa M, López P,et al. Efficacy and safety of ketamine in bipolar depression: A systematic review. Rev Psiquiatr Salud Ment 2017;10:104-112. Larkin, G. L. & Beautrais, A. L. A preliminary naturalistic study of low-dose ketamine for depression and suicide ideation in the emergency department. Int J Neuropsychopharmacol 2011;8:1127-31.
action of other currently approved therapeutics including diclofenac and minocycline. event rates remained low (LogOR−0.56±0.035).As an important side note, we also evaluated efcacy and side efects with the use of ketamine for pain management. requirement of opioids, and ultimately less opioid reduced side effects. (NCS-R). JAMA 289, 3095–3105, doi:10.1001/jama.289.23.3095 (2003). Epidemiology (ICPE) Surveys. Int J Methods Psychiatr Res 12, 3–21, doi:10.1002/(ISSN)1557-0657 (2003). report. Am J Psychiatry 163, 1905–1917, doi:10.1176/ajp.2006.163.11.1905 (2006). depression. Depress Anxiety 31, 335–343, doi:10.1002/da.22253 (2014). patients with treatment-resistant major depressive disorder. J Clin Psychiatry 71, 1605–1611, doi:10.4088/JCP.09m05327blu (2010). 12. Alberich, S. et al. Efcacy and safety of ketamine in bipolar depression: A systematic review. Rev Psiquiatr Salud Ment (2016). emergency department. Int J Neuropsychopharmacol 14, 1127–1131, doi:10.1017/S1461145711000629 (2011). Neuropsychopharmacol Biol Psychiatry 37, 222–226, doi:10.1016/j.pnpbp.2012.02.002 (2012). 15. Rosenblat, J. D. et al. Anti-infammatory agents in the treatment of bipolar depression: a systematic review and meta-analysis. Bipolar Disord 18, 89–101, doi:10.1111/bdi.2016.18.issue-2 (2016). The articles below link to research and mainstream media demonstrating the efficacy of Ketamine infusions and intranasal Ketamine approaches for depression. The IV formulation is very effective for immediate relief of depression and even suicidality. The effects are almost immediate in some of our cases. 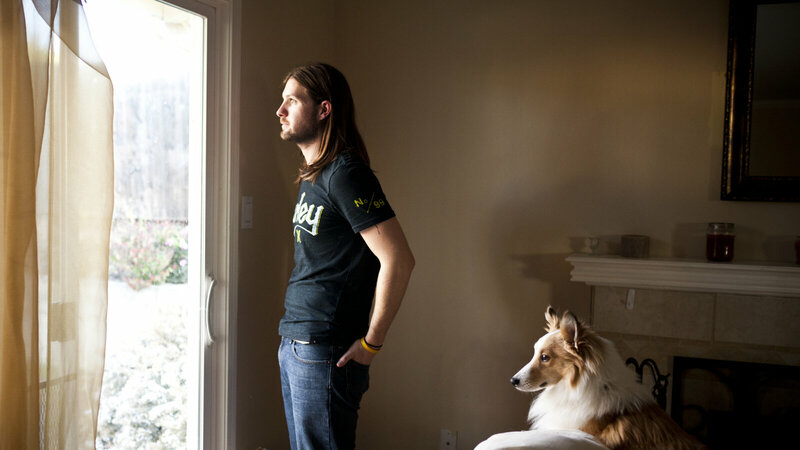 Chris Stephens, 28, has been battling depression all of his life. At times he wouldn’t get out of bed for weeks. In January, he said his depression hadn’t returned since he started taking ketamine. Scientists say they have figured out how an experimental drug called ketamine is able to relieve major depression in hours instead of weeks. Researchers from Yale and the National Institute of Mental Health say ketamine seems to cause a burst of new connections to form between nerve cells in parts of the brain involved in emotion and mood. The discovery, described in Science, should speed development of the first truly new depression drugs since the 1970s, the researchers say. Ketamine is an FDA-approved anesthetic. It’s also a popular club drug that can produce out-of-body experiences. Not exactly the resume you’d expect for a depression drug. But a few years ago, researchers discovered that ketamine could help people with major depression who hadn’t responded to other treatments. What’s more, the relief came almost instantly. The discovery “represents maybe one of the biggest findings in the field over the last 50 years,” Duman says. 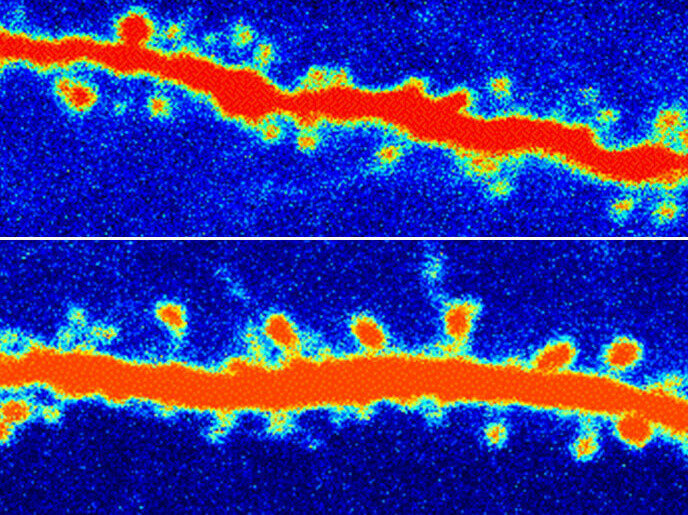 A rat neuron before (top) and after (bottom) ketamine treatment. The increased number of orange nodes are restored connections in the rat’s brain. Depression is associated with a loss of so-called synaptic connections between nerve cells, Duman says. So he and other scientists began to study mice exposed to stresses that produce symptoms a lot like those of human depression. The stressed mice lost connections in certain parts of the brain. 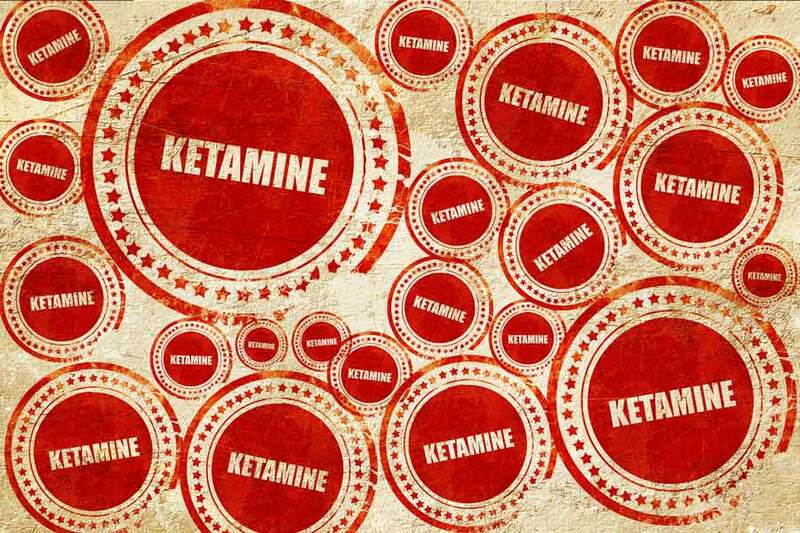 But a dose of ketamine was able to “rapidly increase these connections and also to rapidly reverse the deficits that are caused by stress,” Duman says. A team at the National Institute of Mental Health also has found evidence that ketamine works by encouraging synaptic connections. It’s possible to see the change just by studying rodent brain cells with a microscope, says Carlos Zarate from the Mood and Anxiety Disorders Program at NIMH. And there’s also indirect evidence that ketamine is restoring synaptic connections in people, Zarate says. His team studied 30 depressed patients who got ketamine. And they found changes in brainwave activity that indicated the drug had strengthened connections between neurons in areas of the brain involved in depression. All of this research is intended to produce drugs that will work like ketamine, but without the hallucinations. And several of these alternative drugs are already being tried in people. Preliminary results suggest that “some of these compounds do have rapid antidepressant effects without the side effects that occur with ketamine,” Zarate says. One of these drugs, called GLYX-13, has already been tested in two large groups of people — a key step toward FDA approval. The company that makes the drug, Naurex, says it will tell scientists how well GLYX-13 works at a meeting in December. Clinical experience using intranasal ketamine in the longitudinal treatment of juvenile bipolar disorder with fear of harm phenotype. J Affect Disord. 2018 Jan 1;225:545-551. doi: 10.1016/j.jad.2017.08.081. Epub 2017 Aug 30. Papolos D1, Frei M2, Rossignol D3, Mattis S4, Hernandez-Garcia LC5, Teicher MH5. Fear of Harm (FOH) is a pediatric onset phenotype of bipolar disorder (BD) characterized by BD plus treatment resistance, separation anxiety, aggressive obsessions, parasomnias, and thermal dysregulation. Intranasal ketamine (InK) in 12 youths with BD-FOH produced marked improvement during a two-week trial. Here we report on the open effectiveness and safety of InK in maintenance treatment of BD-FOH from the private practice of one author. As part of a chart review, patients 18 years or older and parents of younger children responded to a clinical effectiveness and safety survey. Effectiveness was assessed from analysis of responses to 49 questions on symptomatology plus qualitative content analyses of written reports and chart review. Adverse events (AEs) were analyzed by frequency, duration and severity. Peak InK doses ranged from 20 to 360mg per administration. Surveys were completed on 45 patients treated with InK for 3 months to 6.5 years. Almost all patients were “much” to “very much” improved clinically and in ratings of social function and academic performance. Significant reductions were reported in all symptom categories. There were 13 reports of persistent AEs, none of which resulted in discontinuation. Acute emergence reactions were sporadically observed in up to 75%, but were mild and of brief duration. Retrospective review from a single practice without placebo control with potential for response and recall bias. InK every 3-4 days at sub-anesthetic doses appeared to be a beneficial and well-tolerated treatment. Use of InK may be considered as a tertiary alternative in treatment refractory cases. Randomized control trials are warranted. Recent studies demonstrating a rapid, robust improvement in treatment resistant depression (TRD) following a single sub-anesthetic infusion of ketamine have generated much excitement. However, these studies are limited in their generalizability to the broader TRD population due to their subject exclusion criteria which typically limit psychiatric comorbidity, concurrent medication, and level of suicide risk. This paper describes the safety and efficacy of sub-anesthetic ketamine infusions in a naturalistic TRD patient sample participating in a real-world TRD treatment program within a major university health system. The effects of a sub-anesthetic dose (0.5mg/kg) of ketamine infused IV over forty minutes on TRD patients participating in a treatment program at the University of California, San Diego was investigated by retrospectively analyzing the medical charts of 41 adult TRD patients with a diagnosis of Major Depressive Disorder (MDD) or Bipolar Disorder (BD). Subjects were aged 48.6, 78% white, 36.6% female, and 82.9% had MDD. Significant psychiatric comorbidity existed in 73%. Average pre-infusion BDI score was 32.6 ± 8.4 (S.D) and dropped to 16.8 ± 3.1 at 24-h post-infusion (p < 0.001). The 24-h response (≥ 50% reduction from pre-infusion) and remission (BDI <13) rates were 53.7% and 41.5%, respectively. Three quarters of responders maintained responder status at 7-days. Ketamine infusions were well tolerated with occasional nausea or anxiety and mild hemodynamic effects during the infusion. Retrospective nature of this study, lack of control group and use of self-report depression ratings scales. This is the first published study of sub-anesthetic ketamine infusions in a real-world TRD population. The results suggest that this treatment is effective and well tolerated in this population. Mitragyna speciosa is a leafy tree that grows from 3-20 meters tall. Its leaves contain 7-Hydroxymitragynine and mitragynine. The leaves are chewed as an opiate substitute and stimulant in Thailand and South-East Asia, primarily among the working class. It has a relatively long history of human use.Kratom (Mitragyna speciosa) is a tropical tree growing from 15-50 feet tall (5-15 meters) that is native to Thailand and Malaysia. It has broad, oval leaves that taper to points, yellow flowers that grow in clusters, and winged seeds. The primary active chemicals are mitragynine, mitraphylline, and 7-hydroxymitragynine, all found in the leaves. Kratom leaves have been chewed for stimulant, sedative, and euphoric effects by people in Thailand and South Asia for centuries. They can also be smoked, brewed as a tea, or made into an extract. Kratom use is relatively uncommon in the US and Europe, though it is available in raw and extract-enhanced forms from ethnobotanical vendors. Kratom leaves differ greatly in potency, depending on the type, grade, and freshness. Leaves with green veins are often claimed to be more potent than those with red veins, but there is contradictory evidence. Low doses are around 2-4 g of plain dried leaf, moderate doses are 3-6 g, and strong doses are 5 g or more. When chewed fresh, half of a large leaf (8-10″) is often enough to produce noticeable effects. The U.S. Food and Drug Administration is warning consumers not to use Mitragyna speciosa, commonly known as kratom, a plant which grows naturally in Thailand, Malaysia, Indonesia, and Papua New Guinea. FDA is concerned that kratom, which affects the same opioid brain receptors as morphine, appears to have properties that expose users to the risks of addiction, abuse, and dependence. There are no FDA-approved uses for kratom, and the agency has received concerning reports about the safety of kratom. FDA is actively evaluating all available scientific information on this issue and continues to warn consumers not to use any products labeled as containing the botanical substance kratom or its psychoactive compounds, mitragynine and 7-hydroxymitragynine. FDA encourages more research to better understand kratom’s safety profile, including the use of kratom combined with other drugs. In September 2014, U.S. Marshals, at the FDA’s request, seized more than 25,000 pounds of raw kratom material worth more than $5 million from Rosefield Management, Inc. in Van Nuys, California. In January 2016, U.S. Marshals, at the FDA’s request, seized nearly 90,000 bottles of dietary supplements labeled as containing kratom and worth more than $400,000. The product, manufactured for and held by Dordoniz Natural Products LLC, located in South Beloit, Illinois, is marketed under the brand name RelaKzpro. In August 2016, U.S. Marshals, at the FDA’s request, seized more than 100 cases of products labeled as containing kratom and worth more than $150,000. The products are distributed by Nature Therapeutics LLC, which does business as Kratom Therapy and is located in Grover Beach, California. The seized products are marketed under the brand name Kratom Therapy. The FDA has issued a public health advisory related to mounting concerns regarding risks associated with the use of kratom. The FDA is concerned about harmful unapproved products that have been crossing our borders in increasing numbers. The agency has a public health obligation to act when we see people being harmed by unapproved products passed off as treatments and cures for serious conditions. Over the past several years, a botanical substance known as kratom has raised significant concerns given its increasing prevalence and potential safety risks. Today, the agency issued a public health advisory related to the FDA’s mounting concerns regarding risks associated with the use of kratom. Kratom is a plant that grows naturally in Thailand, Malaysia, Indonesia and Papua New Guinea. It has gained popularity in the U.S., with some marketers touting it as a “safe” treatment with broad healing properties. Proponents argue that it’s a safe substance largely because it’s a plant-based product. The FDA knows people are using kratom to treat conditions like pain, anxiety and depression, which are serious medical conditions that require proper diagnosis and oversight from a licensed health care provider. We also know that this substance is being actively marketed and distributed for these purposes. Importantly, evidence shows that kratom has similar effects to narcotics like opioids, and carries similar risks of abuse, addiction and in some cases, death. Thus, it’s not surprising that often kratom is taken recreationally by users for its euphoric effects. At a time when we have hit a critical point in the opioid epidemic, the increasing use of kratom as an alternative or adjunct to opioid use is extremely concerning. It’s very troubling to the FDA that patients believe they can use kratom to treat opioid withdrawal symptoms. The FDA is devoted to expanding the development and use of medical therapy to assist in the treatment of opioid use disorder. However, an important part of our commitment to this effort means making sure patients have access to treatments that are proven to be safe and effective. There is no reliable evidence to support the use of kratom as a treatment for opioid use disorder. Patients addicted to opioids are using kratom without dependable instructions for use and more importantly, without consultation with a licensed health care provider about the product’s dangers, potential side effects or interactions with other drugs. There’s clear data on the increasing harms associated with kratom. Calls to U.S. poison control centers regarding kratom have increased 10-fold from 2010 to 2015, with hundreds of calls made each year. The FDA is aware of reports of 36 deaths associated with the use of kratom-containing products. There have been reports of kratom being laced with other opioids like hydrocodone. 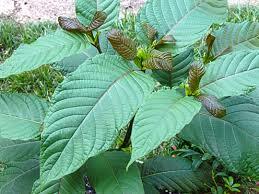 The use of kratom is also associated with serious side effects like seizures, liver damage and withdrawal symptoms. Given all these considerations, we must ask ourselves whether the use of kratom – for recreation, pain or other reasons – could expand the opioid epidemic. Alternatively, if proponents are right and kratom can be used to help treat opioid addiction, patients deserve to have clear, reliable evidence of these benefits. I understand that there’s a lot of interest in the possibility for kratom to be used as a potential therapy for a range of disorders. But the FDA has a science-based obligation that supersedes popular trends and relies on evidence. The FDA has a well-developed process for evaluating botanical drug products where parties seek to make therapeutic claims and is committed to facilitating development of botanical products than can help improve people’s health. We have issued guidance on the proper development of botanical drug products. The agency also has a team of medical reviewers in the FDA’s Center for Drug Evaluation and Research that’s dedicated to the proper development of drug applications for botanicals. To date, no marketer has sought to properly develop a drug that includes kratom. We believe using the FDA’s proven drug review process would provide for a much-needed discussion among all stakeholders. Until then, I want to be clear on one fact: there are currently no FDA-approved therapeutic uses of kratom. Moreover, the FDA has evidence to show that there are significant safety issues associated with its use. Before it can be legally marketed for therapeutic uses in the U.S., kratom’s risks and benefits must be evaluated as part of the regulatory process for drugs that Congress has entrusted the FDA with. Moreover, Congress has also established a specific set of review protocols for scheduling decisions concerning substances like kratom. This is especially relevant given the public’s perception that it can be a safe alternative to prescription opioids. The FDA has exercised jurisdiction over kratom as an unapproved drug, and has also taken action against kratom-containing dietary supplements. To fulfill our public health obligations, we have identified kratom products on two import alerts and we are working to actively prevent shipments of kratom from entering the U.S. At international mail facilities, the FDA has detained hundreds of shipments of kratom. We’ve used our authority to conduct seizures and to oversee the voluntary destruction of kratom products. We’re also working with our federal partners to address the risks posed by these imports. In response to a request from the Drug Enforcement Administration (DEA), the FDA has conducted a comprehensive scientific and medical evaluation of two compounds found in kratom. Kratom is already a controlled substance in 16 countries, including two of its native countries of origin, Thailand and Malaysia, as well as Australia, Sweden and Germany. Kratom is also banned in several states, specifically Alabama, Arkansas, Indiana, Tennessee and Wisconsin and several others have pending legislation to ban it. We’ve learned a tragic lesson from the opioid crisis: that we must pay early attention to the potential for new products to cause addiction and we must take strong, decisive measures to intervene. From the outset, the FDA must use its authority to protect the public from addictive substances like kratom, both as part of our commitment to stemming the opioid epidemic and preventing another from taking hold. As a physician and FDA Commissioner, I stand committed to doing my part to prevent illegal substances that pose a threat to public health from taking their grip on Americans. While we remain open to the potential medicinal uses of kratom, those uses must be backed by sound-science and weighed appropriately against the potential for abuse. They must be put through a proper evaluative process that involves the DEA and the FDA. To those who believe in the proposed medicinal uses of kratom, I encourage you to conduct the research that will help us better understand kratom’s risk and benefit profile, so that well studied and potentially beneficial products can be considered. In the meantime, based on the weight of the evidence, the FDA will continue to take action on these products in order to protect public health.